When we think of giving to the poor, what first comes to mind is non-profit organizations like the Red Cross, the Salvation Army, or World Vision—groups that do disaster relief, economic development, or child sponsorship. those companies make cheap, useful products to sell to the world’s poor, who will use them to become less poor, and everybody wins. For example, one of our friends, Alex Shih, has co-founded an intriguing startup called Global Cycle Solutions (GCS). 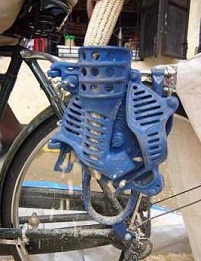 GCS markets affordable technologies that can turn a bicycle into a corn sheller or a cell phone charger. With GCS’s products, small farmers in in rural areas without electricity can shell their corn forty times faster or make extra income charging their neighbor’s cell phones . So if you’re looking to invest your money in ways that benefit the poor, and not just the super-rich on Wall Street, I’d encourage you to learn more about companies like Global Cycle Solutions.